I remember growing up in Iran in the 80s: revolution and war, the dramatic shift of political and social landscape, uncertainty and a sense of suffocation. Among the enormous changes forced upon my generation, was a massive cultural purge that followed the 1979 revolution and affected the whole artistic sphere. Music that was deemed to be non-revolutionary or influenced by the west was banned. History has shown us, however, that music and art usually rebound when faced with censorship. People always come up with ingenious ways to overcome repression, and that is exactly what happened in Iran. The all too familiar pattern of war on artistic expression is wryly conveyed in the new album by pioneers of Iran's underground music movement, KIOSK, who also happen to be my favourite band. The album, “Stereo Tull Presents”, narrates the story of Kamran Mellat, a man who was jailed for several years in the 1980s for distributing unlicensed music that the authorities were so eager to ban. The ambience of the album not only evokes memories of that era, but also draws a striking similarity between now and then. It is a sobering reminder of how little has changed substantially in Iran after almost four decades. Today, only music that passes official censors receives a licence. Musicians without licences operate underground. The authorities continue to criminalize artistic activities, including music and film, leaving a trail of broken promises of freedom for artistic expression. Artists are being treated like criminals, and imprisoned on absurd charges like “insulting Islamic sanctities” and “spreading propaganda against the system”. Sadly, the message in KIOSK's latest album resonates in Iran today. Amnesty International has joined forces with KIOSK to highlight the crackdown on Iranian artists, including musicians and filmmakers. Together we call on Iran to #FreeArtists and to stop treating artists as criminals. Check out our video. Two of these jailed artists are brothers, musician Mehdi Rajabian, and filmmaker Hossein Rajabian, who are serving 3-year prison sentences in Evin Prison. Mehdi is the founder of the Iranian website Barg Music. Launched in 2009, Barg Music distributed unlicensed Persian-language music recorded by Iranian singers from outside the country. Some of this music was political in nature or covered taboo subjects. Some merely had female vocalists. Hossein Rajabian was arrested after making his first feature film, called “Inverted Triangle”, about women’s right to divorce in Iran. The officials executing the arrest, confiscated all the materials related to the film, and have subsequently forbidden that it be broadcast. Hossein Rajabian Mehdi Rajabian Keywan Karimi. Another artist who remains at risk of imprisonment at any moment, is filmmaker Keywan Karimi. Keywan was sentenced to six years’ imprisonment and 223 lashes. An appeal court ruled that he must serve one year of his six-year prison sentence. The rest of the sentence is suspended for a period of five years, on the condition of his “good behaviour”. Keywan was initially also charged with “spreading propaganda against the system” in connection with his film “Writing on the City”, but this charge was not mentioned in the final court ruling. Enough is enough. Iran should protect its citizen’s right to freedom of expression, including in the realm of art. This right is protected in Article 19 of the International Covenant on Civil and Political Rights, of which Iran is a state party. Nobody should be jailed due to their artistic work. 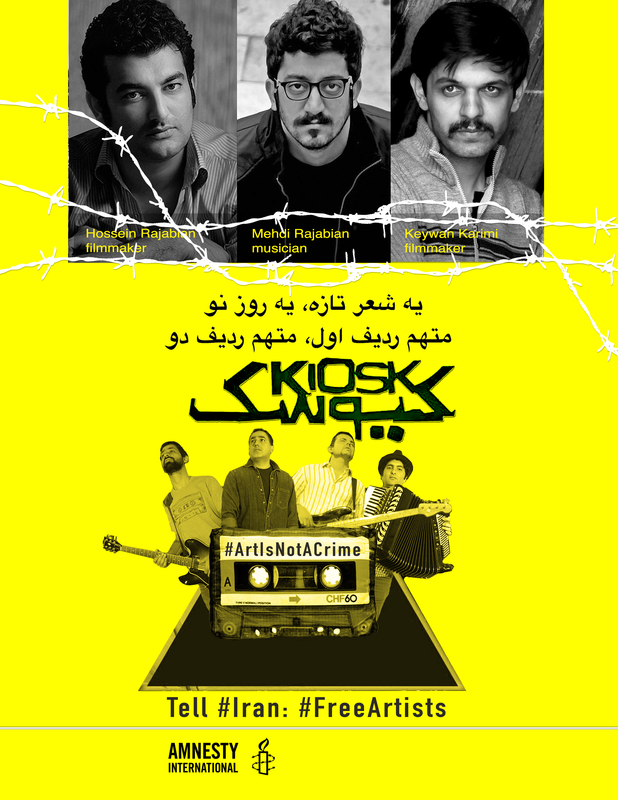 Join Amnesty International and KIOSK and tell Iran to #FreeArtists. Tag the Twitter accounts of Iranian authorities in your pictures when you tweet. Writing on the City will be screened in Reel Awareness Film Festival in Toronto on 18 November 2016. “Kiosk: A Generation Destroyed By Madness” A film by Ala Mohseni.